In a number of programmes we apply our synthesis and thin film characterisation expertise, often in collaboration with groups in Southampton and elsewhere. In the EPSRC Supercritical Fluids Electrodeposition programme grant (SCFED, EP/I033394/1, PI Prof Phil Bartlett) we take the lead in porous materials synthesis for use as nanowire growth hosts. We have collaborated with Prof Alain Walcarius in Nancy to develop optimised templates with small (~1.6 - 3 nm) mesopores aligned perfectly for use in electrodeposition (Fig. 1). Supercritical fluids are good at transporting reagents into these small pores and so are one of the few media that should allow good control over nanowire growth at very small (1-20 nm) size. We are now exploring surface treatments to optimise the pores for deposition of various materials. Under this programme we also look after X-ray diffraction and XPS characterisation, with the diffraction studies including texture and stress measurements on thin films and nanowire assemblies. We also carry out some electrodeposition studies from liquid non-aqueous solvents. Recently we have also been applying the experience gained from our work in sol-gel nitrides to produce highly ordered macroporous films of ternary oxides (Fig. 2). These have high dielectric constants and refractive indices, combined in some cases with photocatalytic activity. In the case of Bi2Ti2O7 this continues our long-standing interest in bismuth pyrochlore materials (some papers included in references section). In 2013 a Rigaku Smartlab Thin Film X-ray diffractometer was purchased via a cross-university EPSRC funding bid coordinated by ALH and Dr Mark Light (EP/K00509X/1 and EP/K009877/1). This allows the in-plane SAXS measurements shown in Fig. 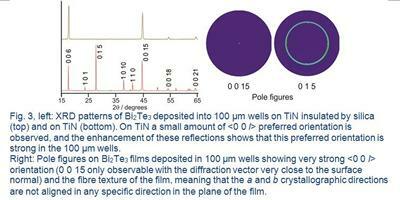 1, but also a number of important thin film measurements that allow crystallite alignment and other parameters, such as stress within films, to be measured. This is used extensively on materials from the SCFED programme (above), but also in the characterisation of electrodeposited phase change memory materials (EPSRC project EP/I010890/1, PI Prof Gill Reid) and CVD-derived materials including those produced for thermoelectric applications. An example for a CVD-derived film is shown in Fig. 3.